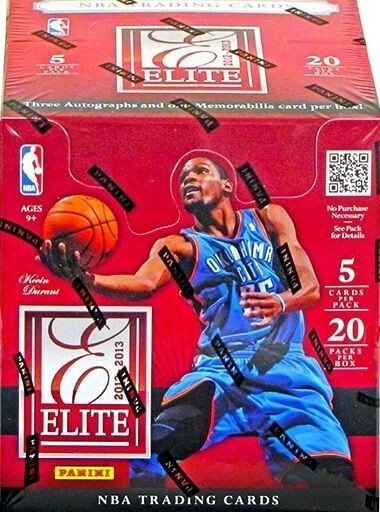 Factory Sealed Panini Elite Basketball Hobby Box mit 20 Packs a 5 Cards per Pack. 3 Autogramme und eine Memorabilia Card per Box ! 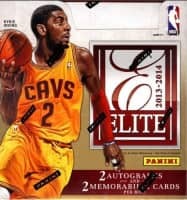 Produktinformationen "2012/13 Panini Elite Basketball Hobby Box NBA"
Each Box contains 3 Autographs and 1 Memorabilia Card! 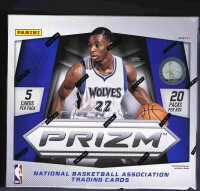 Look for 100 short-printed rookies inserted at two per box! Find great player combinations with the return of the iconic autographed Passing the Torch set! Inserts include: Elite Signatures, All-Time Greats Signatures, Dominators, Craftsmen and both Elite Series and Rookie Elite Series insert sets! Elite is designed as a true collector's set! Rookie Inscriptions: Look for this newly designed, on-card rookie autograph set printed on a clear plastic card stock! Elite Signatures: Check out this clean and classically designed autograph set featuring today's top players! Passing the Torch: Look for player combinations, including Kobe Bryant/Kevin Durant, featuring the current and future faces of the NBA! ROOKIE: Chase a 100-subject rookie subset to complete your Elite set! DOMINATORS: One of the most iconic and recognizable inserts makes its debut as a basketball card! CRAFTSMEN: Find NBA players who have worked hard to perfect their craft-in action, doing what they're most known for! Weiterführende Links zu "2012/13 Panini Elite Basketball Hobby Box NBA"
Fanbewertungen für "2012/13 Panini Elite Basketball Hobby Box NBA"